Posted in: Giggles and Grins, Motley. Best Ever. 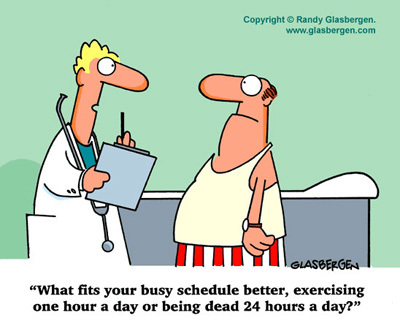 What every exercise physiologist wishes doctors would say. I got tagged again by the Unseen Blogger. And since I have very little to say on my own these days I might as well take advantage of free content. If I repeat anything it’s either because a) my mind is fried and I can think anyway or b) I meant to for emphasis. Yeah, that’s a good excuse. Besides, sometimes they’re actually fun. Today I was driving to a study session when I suddenly started thinking about things that have truly changed our lives, better or worse. So what do you think were the three most influential inventions of the 20th century? The Airplane: The earth suddenly became a lot less ‘vast’ then it used to be and the airplane has been the single greatest influence on this. It has also brought about globalization, which you can argue is either good or bad. The Atomic Bomb: Nearly half of the last century was spent in the grips of the threat of nuclear war. Even in this century it continues to be a major political hot bed. And in splitting the atom we have brought about a source of energy so immense, it’s like having a personal sun right here in our own back yard. The Computer: I was going to say internet but then without computers we wouldn’t have the internet so the computer it is. This little device has done more for just about every other aspect of science, art and life then I think all the others that will grace this list combined. Computers have exponentially given us the ability to advance many aspects of our life to such a degree that 20 years ago many things we have shuffled off to the realm of scifi are now reality. So there you have it. Let me hear from you what you think. Feel free to agree or disagree with any choice on the list but be sure to include the three you would pick. At the end, maybe I’ll take the best of all and post in one big long blogitorial.